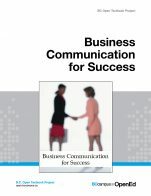 Business Communication for Success cover is used under a CC-BY-NC-SA licence (https://creativecommons.org/licenses/by-nc-sa/4.0/). Business Communication for Success by University of Minnesota Libraries' Publishing Services (Adapted version) is licensed under a Creative Commons Attribution-NonCommercial-ShareAlike 4.0 International License, except where otherwise noted. The content in the book is very comprehensive. It meets the needs of several of our diploma-level business communications courses and could also meet the needs of our degree-level business communications courses. A lot of the content will also be suitable for our diploma-level and degree-level technical communications courses. Several chapters may be useful resources to our degree-level sociology or psychology courses. There is no Table of Contents, Table of Illustrations, or Index. All of which would be useful additions. Accuracy of the content is excellent. Supplemental materials take the form of takeaway statements, exercises, and end-of-unit references. Content is current and relevant. New software for report generation or presentations may mean that some chapters require small updates at some point in the future. The text is written in a straightforward manner. I particularly appreciate how the content of each chapter is "chunked" into small, manageable pieces. Very clear. Relevant. To the point. The writing is very accessible. While the book is written for diploma- and degree-level students, the writing itself is not heavily academic. Consistent writing and editing voice. There is consistency in terminology. If by framework you mean the flow of the writing and the organization of the formatting, then both are excellent. The layout of the chapters/units within chapters is logical and it makes navigation very easy. The chapters are broken up into manageable "chunks" so that students are not overwhelmed with large chunks of academic text. Because the content is broken into smaller units, it would be very easy for an instructor/professor to assign reading material. It's also these smaller chunks/units that make the book so flexible, accessible, and manageable for students (even reluctant students) because some chapters or units within those chapters would be supplemental reading material in courses other than business communications courses. It's going to be very easy to select chapters and units within chapters as reading material in several different courses. They topics in the book are presented in a logical, clear fashion. There's a logical flow from one topic to the next. There's also a logical flow from one unit in a chapter to the next. There's organization consistency (which supports the logical flow of content) in each chapter and each unit within the chapter. Each chapter has one or more quotes relevant to the content, introductory exercises, content, learning objectives, key takeaways (which function as a unit summary), and suggested exercises. The unit exercises are relevant and interesting. They provide students and instructor/professor with ideas and options. Most of the unit exercises will work (or can be adapted) for both on-campus students and distance students. I didn't notice any interface issues or navigation problems. Images displayed just fine. The only distraction I noted was on page 253 where the e-mail example appears to overlay some of the chapter text. 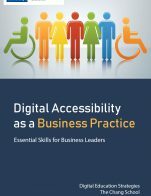 I assume that the book can be read by an e-reader for those students with vision limitations/challenges and that it will display well on mobile devices. I will be following up with my institution's multi-media team and Accessibility committee to ensure that we are not disadvantaging some students. I was not aware of any grammatical or spelling errors. The following images will need citations, though: Fig 14.1, 14.3, 14.5, and 16.2. The author was aware of and respectful of inclusion and diversity. The author used he/she in most instances and occasionally "they" as a singular pronoun. Several chapters included content that made students think beyond their own culture. One whole chapter is devoted to doing business in other cultures. Many of the photos are U.S. based and some coud be changed. While there are some photos with non-caucasion participants, many could be changed to include a more diverse group including indigenous students and those with obvious physical disabilities. I would recommend this book. In fact, I have recommended it to several colleagues for several of our business communications courses as a starting point. 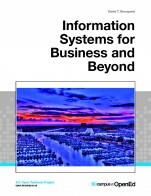 This text covers many areas and ideas relevant to business communication. The index is complete and easy to navigate. However, I felt that some of the areas were not covered in enough detail, with enough examples, or with enough practice. For this reason, I think this textbook is suitable for students past first and second year levels of study. I found no errors in the content and found it to be unbiased, with the exception of intercultural communication. My comments are included in the response to Question 10. I found the content up-to-date and the assignments reflective of the digital world of students. Updates would be easy to make as technologies that are mentioned sunset, making way for new technologies to be referred to. The short chapters with short sections make it easy to make such changes; there is no one section that is so large or at risk of being dated that I have concerns. I found the prose accessible and pleasant. I felt there could have been more description and examples used throughout the text, especially for some of the more technical aspects (such as the fundamentals of revision) and philosophical aspects (such as intrapersonal communication and intercultural communication). The textbook is incredibly consistent in both terminology and framework, making it easy to read and navigate. As an instructor, it is clear how the textbook has been organized and why. 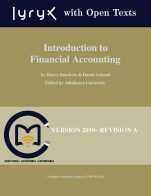 It is also clear how the textbook has been created, with three foundational chapters and an array of additional chapters from which an instructor can "mix and match" to best suit the needs of the program and students. As mentioned in my previous comment, this is one of the major strengths of this textbook. As an experienced instructor who has taught Business Communications courses many times and at a handful of institutions, I can easily imagine which sections I would draw on after teaching the first three chapters. I also really liked that the "additional" chapters (those that come after the first three) are not just a smattering of different aspects of business communication, but go deeply into these different aspects. It would be easy to tailor a course to focus heavily on writing, with a little bit on presentations, or to focus heavily on the spoken word. Rounding out this ability for the instructor to balance writing and speaking are some true gems on effective group work, meetings, and leadership. Most of the topics are presented clearly, with accessible descriptions and a few examples. However, I think the text would be strengthened with more examples, more scaffolding for some of the activities, and more opportunities to practice the content - although that might be seen to be the work on the instructor, to interpret the text for the students. The more abstruse topics of intrapersonal communication and some of the points raised in the section on intercultural communication could be brought more into students' daily lives through the text, not just in the exercises. I encountered absolutely no issues with the interface of this text. I used the online version on my tablet and found the text easy to navigate and read. The images were helpful and provided some clarity to concepts presented in the text. The text has no insensitive or offensive language. The photos represent a diversity of people. However, I felt that the textbook often (but not always) assumed homogeneity in the classroom. For example, in chapter 1.4, there could have been mention of high context/low context cultures, which would likely have been represented in the classroom by students, who would likely hail from different co-cultures. Also absent was explanation of how to interpret the impact of culture on written texts. Third, I thought the chapter on intercultural communication was interesting, but not applied to students' daily life, which kept it abstruse and philosophical, instead of tangible and practical. Intercultural communication can be a separate chapter, but should also be woven throughout the textbook to help students navigate the various and ongoing impacts of cultural differences on both written and spoken business communication. 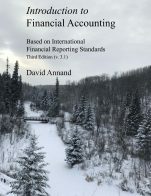 This textbook would benefit from more examples, more practice opportunities, and more scaffolding to some of the more challenging ideas and skill sets. For example, the sections on plagiarism and incorporating the ideas of others should include more examples of incorrect and correct paraphrases, quotations, and summaries. This is often a challenging learning goal for students, which means they need to see more examples and have more practice. As it stands, the text seems to focus more on the ethics of plagiarism instead of the more common accidental plagiarism that reflects a growing, but incomplete, writing skill set. That said, as an experienced instructor who has taught many, many sections of Business Communications, I would use this text because it is easy to pick and choose from and I can imagine how to build on each section. But for a new instructor, this textbook may not be the easiest starting point for the first time teaching Business Communication.